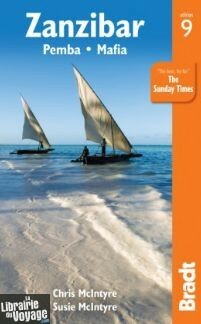 A new, thoroughly updated ninth edition of the most comprehensive guide to Zanzibar available, with a complete review of accommodation listings to cover new options in all price brackets on all three main islands (over 300 properties visited personally). Also included is more detailed coverage of Zanzibar's cultural, historic and environmental status than in any other travel guide to the area, while many of the city/town/village maps have been redrawn and accurately updated, with every property, major attraction, eatery and road recorded to provide a detailed level of guidance. The authors aim to direct readers to the more ethically minded hotels, tour operators and activities, from a focus on fair-trade shopping opportunities to marine awareness guidelines. Bradt's Zanzibar is the most frequently updated book on the islands: the authors are personally known in the region for their face-to-face, on-the-ground research methods and this is the book of choice for hoteliers and expatriate workers/residents on Zanzibar. The guide also includes a dedicated section on southern Tanzanian safaris in the Selous and Ruaha National Park, making this the ideal choice for a bush and beach combination. Le guide le plus complet sur l'île de Zanzibar, mais en anglais uniquement.